This article in the New York Times sent Jeremy and I on a wild expedition to find the rarest cuisine in New York—Uighur. 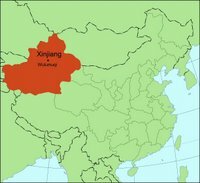 The Uighur (also spelled Uyghur and pronounced “Wéiwú'ěr”) are a Turkic-speaking people who inhabit the steppes in northeast China. Originally descended from nomadic Mongols, their ethnicity and culture were heavily influenced by their proximity to and eventual occupation by China, as well as the advent of the Silk Road and its exotic travelers, many of whom settled among the Uighur. Café Kashkar, on Brighton Beach Avenue and 14th Street in the all-Russian Brighton neighborhood, revealed that Uighur diversity carries over to its cuisine. One of Kashkar’s featured dishes, for instance, is lagman—and if that sounds a little like Chinese lo mein to you, it’s because that’s what it’s derived from. Kashkar’s lagman noodles were handmade and thus delightfully irregular, served with sautéed meat and vegetables in a flavorful sauce. But that’s whre the similarity to lo mein ended—the meat was invariably tender morsels of lamb, and the sauce was made with a generous amount of chili oil and a touch of curry. 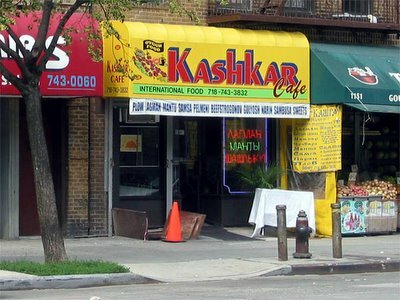 After a lengthy visit to MoMA and the hour-long train ride to Brighton, Jeremy and I arrived at the brightly-lit door of Café Kashkar famished. Inside under the flourescents, silk flowers cascaded over a deli-counter full of kebabs, a TV blared MTV-style Russian pop, and hairy, jovial Russian mobsters brawled congenially over the bill. “If you respect me,” one slurred, gripping the skull of his fellow diner in one hand and his belly in the other, “you will let me honor you with this meal.” Each occupied table had medium-sized bottles of Russian vodka on it, presumably from the liquor store next door. 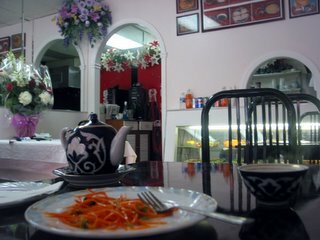 We sat and were immediately presented with a pot of green tea and little Chinese tea cups; the tea leaves inside the pot were not only loose, but whole. The tea was delicious. Our appetites convinced us to order everything on the menu that was remotely pronouncable (note that the menu items were largely Uighur words written first in Russian and then, badly, in English). I began with a samsa, which is the Uighur version of the Indian samosa: a pastry stuffed with seasoned meat. Samsas are are baked instead of fried and (at least at Kashkar) come only in the lamb variety. The flaky pastry dough concealed a simple, delicious mix of steaming lamb, onions, and spices. Jeremy had noticed naan on the menu, and seeing that my samsa was even better than Indian samosa, thought that perhaps bread that is traditionally Indian might be too! We both anticipated the crisp, flaky pastry familiar to us, and were very surprised when the naan arrived: its warm bulk gleamed in the breadbasket and weighed more than a pound! “It’s like a super-bagel!” Jeremy spluttered through his first bite. 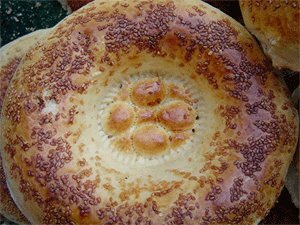 “Like a giant frisbee bialy!” One could imagine Jewish traders carrying wheels of this dense bread cross-continent to China, where Uighur bakers perfected the recipe with an eggwhite glaze and a delicious smattering of sesame seeds. Jeremy’s lagman arrived, along with my chuchwara—a sort of Turkified wonton soup. The little wonton-like dumplings were filled with (predictably) lamb, and each spoonful brought up a bounty of strange flavors—red pepper, pearl onions, and cilantro. The bowl was huge and quite hot. Jeremy’s chicken kebab arrived arrived on a sword and had exquisite texture (though a little of that propane-fueled-fire aftertaste that lots of rotisserie items have in the city). We asked for sodas, and our server brought out two: a pear-flavored one and a (get ready) tarragon-flavored one. No doubt these are Russian, rather than Uighur, but were nonetheless an exciting addition to our meal. The tarragon was particularly good. After eating as much as we possibly could (and wrapping a considerable amount up to take home), we agreed that, in spite of the utter impossibility of eating more, we couldn’t leave without getting the mysterious chak-chak for dessert. Our server brought us out a double-portion (just to see if we could eat it, I imagine)! Jeremy describes the chak-chak as a “Paul-Bunyon-sized Rice Krispie Treat.” Vaguely reminiscent of funnel cake, chak-chak is fried ribbons of dough, pressed into a pan and doused in honey, then cut and served in blocks. I think it is a Russian dessert, rather than a Uighur one. It was mildly sweet, infernally sticky, and a tasty finish to our meal. We paid our bill (a modest one for the immense amount of food we ordered—around $30), exchanged grateful words with our attentive server, and rolled home, swinging “I heart NY” bags full of Chinese lagman, Indian/Jewish naan, and Russian chak-chak at our sides…wishing we were Uighur! You never fail to surprise and enlighten with your blog. :) I'm thoroughly enjoying it! Now I'm really curious to both make pound cake and try this cuisine. Thanks!I got a hankering, too, and made a cake last night. You wouldn't believe how hard it is to find a Bundt pan in the Lower East Side, though! Love your Blog and I am so proud to have passed the legendary pound cake recipe on to you. What a wonderful cook you have become! I can still see you with cake batter on your face and smelling of vanilla behind your ears. Can't wait for the next addition to pie in the sky! This is a great blog Kate!!! I still think Culinary School should be a part of your future plan!!!! A southern/asian/tapas restaurant would flourish in the East Village! I'll be roasting a chicken tonight now!